Task Force Departures from Monday 26th April - Diesel patrol submarine "Onyx" sailed from Gosport on Monday at the same time as the last of the Amphibious Group headed for Ascension. Assault ship "Intrepid", not long after being readied for disposal, left from Portland, RO-RO ferry "Norland" from Portsmouth with the men of 2 Para, followed by the sixth LSL "Sir Bedivere" from Marchwood after returning from Vancouver, Canada. The early part of the week also saw the departure from Devonport of RFA support tanker "Bayleaf" on her maiden voyage and tanker "British Avon" from Portsmouth. Quite separately, RFA fleet tanker "Tidepool" arrived at Ascension from Curacoa with a full British crew after being borrowed back from Chile to where she was being delivered. During the week a variety of small ships headed for Ascension. Converted for minesweeping duties at Rosyth, the five trawlers "Cordella", "Farnella", "Junella", "Northella" and "Pict" left Portland on Tuesday 27th with Navy crews after working-up as the 11th Mine Countermeasures Squadron. Next to go were three despatch ships, two of them Navy fishery protection vessels from Portland after being modified at Portsmouth - "Leeds Castle" on Thursday and "Dumbarton Castle" on Saturday, and from Devonport on Thursday cable ship "Iris". By the end of the week RMAS mooring, salvage and boom vessel "Goosander" was on her way from Rosyth to lay out and maintain the moorings at Ascension. Ascension - As 3 Cdo Bde prepared to move south and "Canberra" practised offloading her troops by LCU and helicopter, various ships reached the island and usually in a matter of days or less, continued south. By the weekend, this included the slower LSL Group of the Amphibious Task Group which was on its way escorted by frigate "Antelope". By then Major General Moore had flown down to meet Thompson and Clapp to review the landing options now reduced to three East Falkland's sites. With two around Stanley and thus close to the main Argentine defences, San Carlos Water became the preferred option. Important air movements also took place. On Thursday 29th the first two Vulcan B.2 bombers arrived from Waddington to prepare for "Black Buck 1", the opening raid on Stanley on Saturday. And over Saturday and Sunday, eight Sea Harriers of No.809 NAS reached Wideawake after making the nine hour flight from Yeovilton refuelled by Victor tankers. 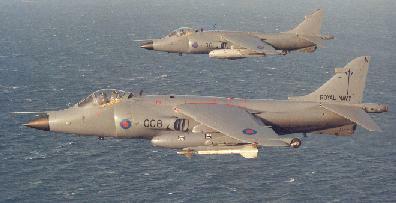 There they awaited the arrival of RAF GR.3's and their transport south, the doomed "Atlantic Conveyor". South Atlantic - As the Carrier Battle Group approached the eastern edge of the TEZ, frigates "Brilliant" and "Plymouth" joined up on Thursday from South Georgia carrying No.2 SBS and D Sqdn SAS. Next day the TEZ came into force, and on Saturday 1st May, the Royal Navy sailed in to start the softening-up attacks designed to establish air and sea superiority. Earlier in the week, Argentine trawler "Narwhal" was warned to keep clear of the Task Force and on Sunday, off to the south west, cruiser "General Belgrano" was torpedoed and sunk by the "Conqueror". That same Sunday, "Tidespring" and "Antrim" departed South Georgia for Ascension carrying the Argentine POW's. Aircraft/helicopter support ship "Atlantic Conveyor"